This was the inaugural championships and there was an encouraging entry of 7 girls for the U15s and 8 for the U19 age groups from 6 different schools. In the U19’s, whilst there were some strong contests in the group matches, India Deakin (Cheltenham College) and Isolde Taylor (Wycombe Abbey) emerged as convincing winners. Playing to 8 the final was a cracking match. The first four games were very even with Issy retrieving beautifully and India hitting some stinging backhands. With her attacking shots and good hands India began to creep ahead, 4 – 2, 5 – 3, 7 – 4. Issy retaliated with some accurate play saving 3 match points to get back to 6 – 7. However, at this stage India attacked again and played some excellent volleys to win the match 8 – 6. 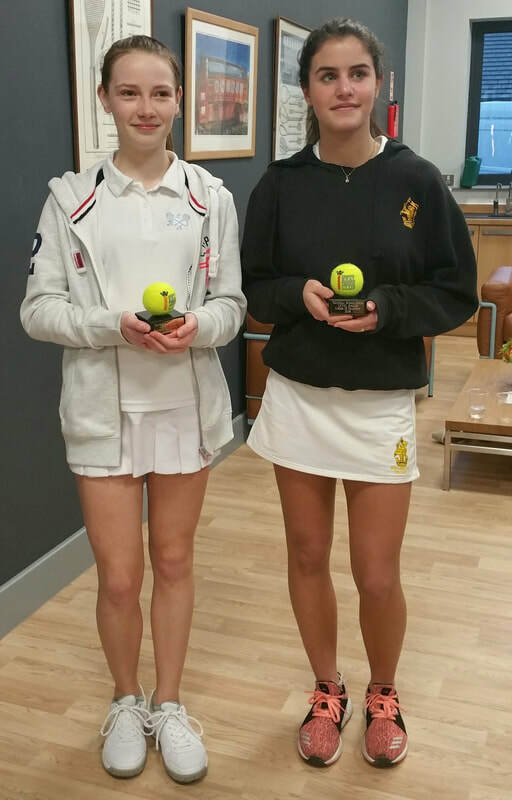 In the U15 Final Daisy Bristowe (Wellington College) played against Olivia Boulton (Oaklands RC School). Daisy raced to a 3 – 0 lead hitting some lovely flat cross-court forehands which was very beneficial from the hazard end. Daisy also produced some tricky serves, but Olivia played well to pick many of them up close to the back wall. In the next 5 games, 4 games went to deuce. Olivia managed to sneak another game at 7 – 1 down and whilst Olivia rallied well, Daisy moved around the court quickly, volleyed well and was the more attacking player so deservedly finally won 8 - 2. Our thanks to The Dedanists’ Society for sponsoring this competition and to Dan Jones, Adam Player and Simon Roundell for assisting in the organisation of the competition. All Group matches are first to 5 games. Winner of group 1 progresses into group 2. 1st & 2nd Place in group 2 will contest the final @ 3pm.